If you have task that need to be repeated regularly during the execution of the project, you can enter that task as recurring task. For example, you want to schedule weekly project team meetings every Wednesday from 3 pm to 4 pm. The below steps will help us to create the recurring task in project plan; it automatically inserted the task name with date and time and creates in multiple rows. On Gantt chart, select the Task Name field on the row where you want to insert the recurring task. 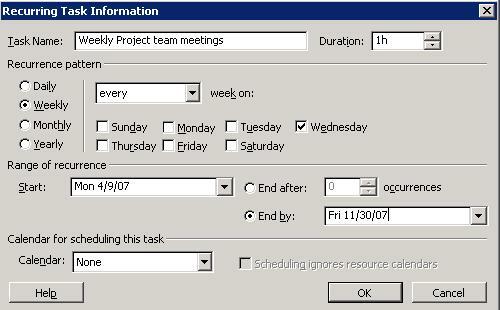 Recurring Task information box appears as follows. 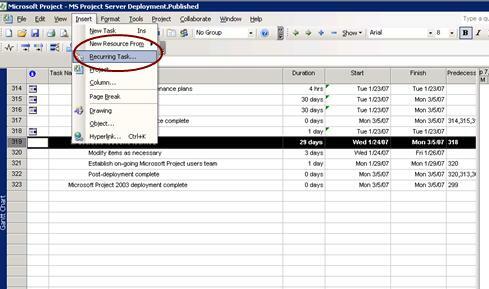 Specify task name and duration of each occurrence of the task and frequency of task need to be scheduled.